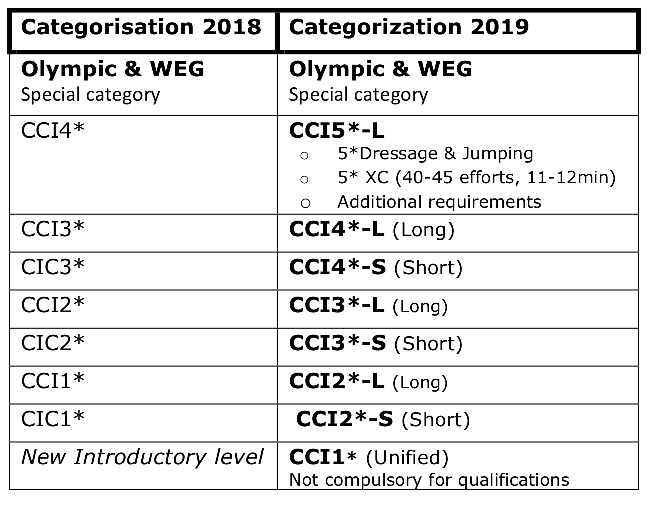 The Fédération Equestre Internationale has released their list of proposed rule changes for eventing in 2019. Following high profile incidents this year, including Oliver Townend’s verbal warnings for excessive use of the whip at the Mitsubishi Motors Badminton Horse Trials CCI**** (England) and controversy over blood spotted on Marilyn’s Little’s RF Scandalous at the Land Rover Kentucky CCI****, the FEI Eventing Committee took a look at rules pertaining to whip use, blood on horses and yellow cards. National federations will have a chance to weigh in on the proposed changes before a second draft is drawn up in the fall. Then the changes will be voted on at the FEI General Assembly in November to go into effect Jan. 1, 2019. 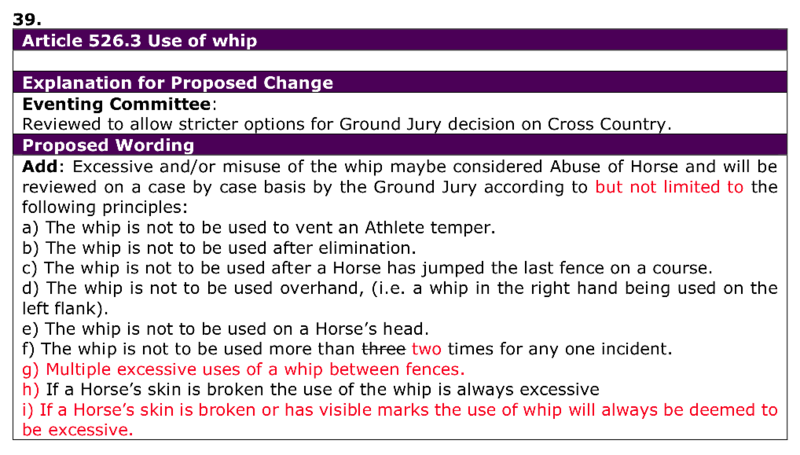 In addition to the scenarios laid out in the previous rule, the whip “will not be used more than two times for any one incident,” when previously it was three times. The Eventing Committee added a definition of “athlete induced blood” to differentiate between minor brush injuries on cross-country. All blood on the horse, if induced by the rider via spurs, bit or whip, must be reviewed on a case-by-case basis by the ground jury, but not all cases of blood will lead to elimination. For show jumping, the proposed change states that horses with blood on the flank(s) and/or bleeding in the mouth will be eliminated. In the case of a minor amount of blood, such as when a horse bites its tongue or lip, officials may authorize the rinsing or wiping of the mouth and allow the athlete to continue, but any further evidence of blood would result in elimination. The FEI is looking into clarifying the yellow card system. Recorded verbal warnings would be known as recorded warnings if the proposed changes pass. The Eventing Committee suggests a recorded warning issued by the ground jury (after providing the athlete the opportunity to have a hearing), for all minor cases of blood induced by the athlete in the mouth or related to spurs. All cases of excessive use of the whip would be automatically sanctioned with a yellow card or by stronger sanctions. A yellow card would be automatically awarded if an athlete continues after three refusals. If an athlete receives more than one recorded warning for athlete-induced blood on a horse within three years, he would automatically be issued a yellow card. Two recorded warnings for the same offense would result in a yellow card. Currently if an athlete receives two yellow cards in a year, they’re suspended for two months. The proposed rule change would raise that to four months. The rule would change to “the body” of the horse, and, “15 penalties will be given in case the horse misses a flag but clearly negotiated the element or obstacle.” Re-presenting to the obstacle if an athlete wasn’t sure if they missed the flag would not be required. The committee also added that they would like only official video recording to be used as evidence in cases of missing a flag. A change to Annex A—9 Dressage Tests, seeks to line up eventing dressage tests with pure dressage. The committee proposes that the collective marks be replaced by one overall mark, harmony of athlete and horse, with a coefficient of 2. In 2019, the definition of categories of eventing will change. All events will be defined as CCIs. A CCI-L (long format) will replace CCI, and CCI-S (short format) will replace CIC. The Eventing Committee is proposing a gradual introduction of the new CCI***** level system, which would include long and major. Existing CCI**** events will be known as CCI*****-L in 2019 and will be able to fulfill requirements listed over a period of two years. The “major” designation and requirements will be developed at a later stage with the support of interested events. The Olympics and World Equestrian Games would have their own special category. As is currently the rule, for the FEI Nations Cup series, at least three national federations must take part for the competition to be recognized, but the committee proposes that if less than five national federations have teams entered for a CCIO, the invitation may be extended to include two teams per national federation, including the host team. If a national federation has more than one team, they must decide which team will compete for Nations Cup points before the start of the event.